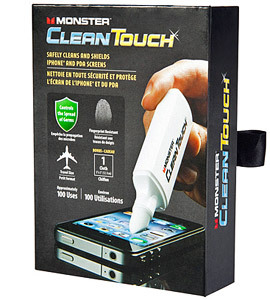 Monster has just released a new product that makes cleaning your iOS devices – specifically the iPhone and iPod touch – much more convenient. It’s both travel and touchscreen friendly. We’re constantly touching our iOS gadgets and gunking them up with greasy fingerprints. Wiping the screen of an iPhone on your pants is usually effective enough, but it mostly just spreads the oils (and germs) around rather than removing them. Monster has developed a new product to combat this problem. The Monster CleanTouch Pen retails for $24.95 and lasts for up to 100 uses. It’s unique in that there is no bottle to carry around with a cloth or cleaning solution to spray on your device. You simply pop the cap of the CleanTouch Pen, “write” all over your screen with the tip, and wipe the thin layer of solution off with the built-in microfiber pad. Within seconds your iPhone, iPod touch, or iPad screen is spotless. One thing that sets the CleanTouch Pen apart from other cleaning products is that it doesn’t streak, stain, or damage the special coatings on the screen. Better yet, it’s alcohol and ammonia-free, and it helps prevent the spread of germs. Monster points out that the CleanTouch Pen is TSA-approved for air travel as well. In my use, the product did a great job cleaning my iPhone and iPad screens. They looked fantastic afterwards and even felt smoother to the touch. I can definitely see why many would want to throw this in a bag to clean their device on the go when it starts to get filthy. Monster claims the CleanTouch Pen applies a thin coating to the screen that resists scratches and fingerprints, but those results were less obvious. Fingerprints reappeared within minutes of use, although they didn’t smear as easily. Win a free Monster CleanTouch Pen! The makers of the CleanTouch Pen (regularly $24.95) have been kind enough to offer free product samples to 2 lucky MacYourself readers! To enter, please leave a comment below, along with a valid email address (this is how we will contact you to get your shipping information). In order to avoid spam filter issues, please type a coherent sentence saying you’d like a chance to win. Multiple entries will be deleted, so please only add one comment per person. And finally, don’t worry if your comment doesn’t appear on the site immediately – it might be awaiting moderation and will show up shortly. Please note only those living in the 48 contiguous United States are eligible to enter. The winners will be chosen at random based on the comment numbers they happen to be. The lucky guys or girls will be announced on this page, so save this article’s URL and be sure to check back later. All entries must be made by July 21, 2011 at 11:59pm eastern U.S. time. In the meantime, check out Monster’s website to learn more about the CleanTouch Pen. Good luck! Congratulations to our winners Chris and Megan! Their comment numbers were chosen from a random number generator and they will each be sent a free Monster CleanTouch Pen! Thanks to everyone who entered and remember to consider purchasing one yourself to keep your iPhone, iPod touch, or iPad screen clean. I would like to enter..love everything nice and clean!! Please sign me up to win a free Monster CleanTouch Pen! My iPad and iPhone qualify as dirty enough. Looks like a great solution to a really pesky problem. I especially like the anti-microbial feature…who would have guessed our touch screens were little germ factories!!! I travel a lot and this would bee the perfect solution for my iPhone and iPad. Hope I win one. I love my iPhone! I also love fried chicken. I need this. Interesting! What will Monster come up with next? Looks like I will love your product so let me try it please, before I purchase it! Ooh awesome! I would love to win! Damn do I need something to keep smudges off my phone screen. I would love to win! Monster products have always been great. Have an iPad, iPhone and Mac Book Pro I would love to use it on!! I’d like a chance to win this. Thanks! I love gadgets for gadgets. Especially when those gadgets clean other gadgets. Cool! I need one of these!!! I would really love to win this, my iPhone screen has been crying for this for a long time. Perfect! My cleaning solution just ran out, too. I will be thinking of this product every time I pick up my iPad after the 5 year old got ahold it! My wife’s iPhone is disgusting. Her screen is constantly smudged up with makeup. Even with a micro-fiber cloth it never gets clean. If I win I will give it to her as a gift. I would love a chance to win one for my iPhone. very cool and useful product! I like to keep my stuff clean, I need the Monster CleanTouch Pen. Looks like a good product! It would be extremely useful for my iPod touch.